As the middle child and only son of Seattle lawyer William H. Gates Sr. and Mary Gates, a board member of the United Way, William Gates III became the co-founder of Microsoft, one of the richest men in the world and the purveyor of the operating system Windows, which was released 25 years ago, on Nov. 10, 1983. 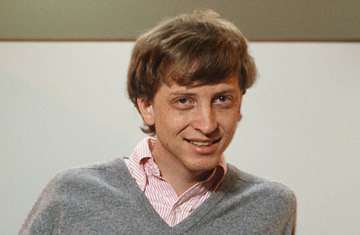 Before his days as a billionaire, Gates was a student at the exclusive Lakeside School in Seattle, writing programs on a school typewriter with his friend upperclassman Paul Allen. While Gates was an undergraduate at Harvard in 1975, the two men pitched their programming language BASIC to MITS, a company that was marketing an early personal computer, the Altair 8800. MITS agreed to use the language they'd developed, and Gates and Allen began referring to their venture as Micro-Soft, registering the word Microsoft as a trademark a year later. Gates soon after quit Harvard for good  but not before making the acquaintance of Steve Ballmer, who has been Microsoft's CEO since 2000.